We're starting to come to the end of the blossom season in London, but there are still plenty of trees in bloom around the city. Blossom can be spotted in London's major parks (such as Greenwich Park, Regent's Park, St James's Park, Holland Park and Kew Gardens), as well as in residential areas (for example Chelsea, Notting Hill, Crouch End and Kensington). Another popular place for finding blossom is just behind St Paul's Cathedral. If you haven't got any plans for the 20th, head down to Trafalgar Square for the Feast of St George. At the family-friendly event, you will find a farmer's market, brass band and a medieval jousting tiltyard, as well as a Dance and Storytelling Tent and music from a range of acts, including The London Folk Youth Ensemble and West End Musical Choir. Londoners can also take part in the St George's Day celebrations at Vauxhall Pleasure Gardens or at various pubs across the city. Need a quiet space to read or study on a warm day? 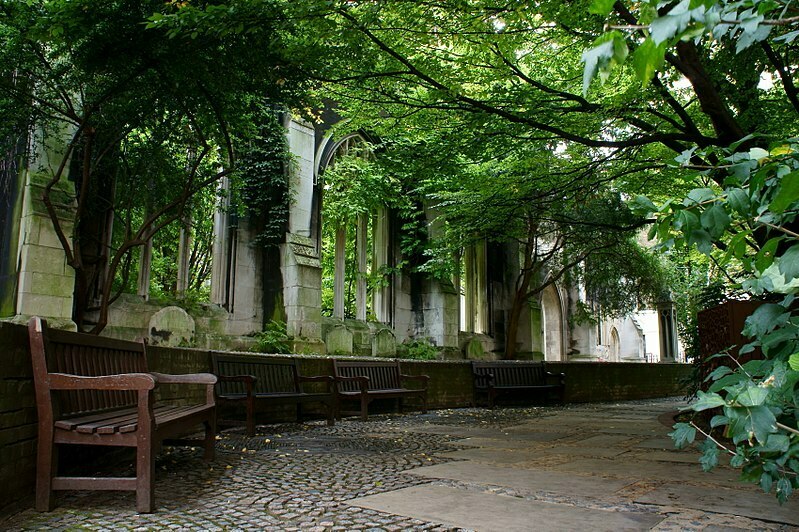 Why not go St Dunstan-in-the-East? Located between Monument and Tower Hill stations, this former medieval church is ideal if you want to get away from the crowds of central London and don't feel like being cooped up inside all day. The church was thought to have been constructed in 1100 and was damaged during the Great Fire of London and Blitz bombing. It has since become a hidden spot for students, photographers and workers in the city. If you have kids, be sure to take them to a city farm during the Easter break. Little ones will enjoy meeting all the animals, which range from small farmyard creatures like chickens and rabbits to bigger animals like alpacas, llamas and horses, and taking part in Easter-themed activities. There are at least a dozen farms across London, in areas such as Spitalfields, Hackney, Vauxhall and Kentish Town. From the 5th of April to 29th of September, Underbelly Festival will return to South Bank for its eleventh year. Ticketholders can expect over 70 shows of circus, comedy, cabaret and children's entertainment, as well as alfresco dining. This year you can enjoy a live adaptation of The Wind in the Willows from Box Tale Soup or marvel at the acrobatic skills in A Simple Space. This April, the Museum of London will be taken over by Beasts of London, an immersive tour that explores how animals have shaped the capital. The exhibition spans from the Roman era to the present day and focuses on animals such as elephants, horses and pigeons, which have played an important part in London's history. Kids can join in the craft workshops and storytelling sessions during the school holidays. A traditional Easter Egg Hunt is the perfect way to get the whole family together this Easter. Instead if chocolate, the Easter Adventure Quests at English Heritage Sites like Kenwood will have you looking for dragon eggs. Kids will also have fun searching for Lindt chocolate bunnies at Hampton Court Palace, Cadbury Easter Eggs at Morden Hall Park, and different creatures at Fenton House. Chances are it will rain at some point this month so be sure to check out the hugely successful West End production Motown The Musical before it leaves Shaftesbury Theatre on the 20th. This upbeat musical follows the story of Berry Gordy, who went from boxer to music mogul, and showcases over 40 hits from artists such as Martha and the Vandellas, The Supremes, Stevie Wonder and Marvin Gaye. Tickets range from £45 to £145 and can be found on the Shaftesbury Theatre website.